These earthworms are outta this world. We love worms of all sizes. 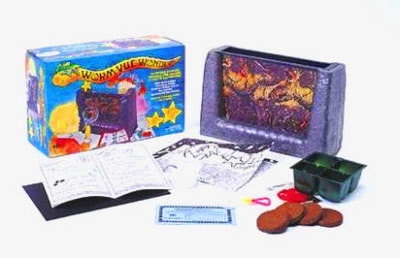 Watch worms slither and crawl through the Worm-Vue Wonders. With this Earth worm farm you can watch your live worms that you gather from outside or order with the included forms they create cool caverns and tunnels that you can watch with the included magnifying glass. Perform Science experiments for school and Foss projects to demonstrate worm life.. In the worm-vue wonder you can do just that. You can also go outside and plan your own activities like digging up earthworms so send in your pictures. Complete worm farm kit includes: Double-sided viewing unit with shield and tray (keeps light out - worms in), live action experiment booklet, facts & anatomy poster, worm cutouts, magnifying glass, growing tray, litmus paper and cups. Mail-in certificate for 200 live worms for your farm, 3 types of soil layers, worm castings and food shipped Priority Mail year-round in U.S.A. (48 states).